خانی, مجتبی, بهرامی, علی, مومنی, وحید. (1397). محافظت از گرفتگی زیستی حسگرها در محیط دریایی. نشریه شیمی و مهندسی شیمی ایران, 37(1), 251-265. مجتبی خانی; علی بهرامی; وحید مومنی. "محافظت از گرفتگی زیستی حسگرها در محیط دریایی". نشریه شیمی و مهندسی شیمی ایران, 37, 1, 1397, 251-265. خانی, مجتبی, بهرامی, علی, مومنی, وحید. (1397). 'محافظت از گرفتگی زیستی حسگرها در محیط دریایی', نشریه شیمی و مهندسی شیمی ایران, 37(1), pp. 251-265. خانی, مجتبی, بهرامی, علی, مومنی, وحید. محافظت از گرفتگی زیستی حسگرها در محیط دریایی. 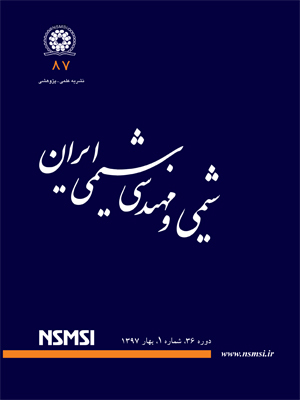 نشریه شیمی و مهندسی شیمی ایران, 1397; 37(1): 251-265. گرفتگی زیستی، فرایند چسبندگی ریزسازواره‌ها و تکثیر آن‌ها روی سطوح است. گرفتگی زیستی، مشکل ایجاد شده توسط لایه‌نازک زیستی است. این گرفتگی در طیف گسترده‌ای از فرایندهای صنعتی اتفاق می ­افتد و در همه آن‌ها به ویژه برخی از تجهیزهای گران مشکل­ هایی ایجاد می‌کند. در صنایع گوناگون به‌صورت جداگانه برای مقابله با این موضوع کار شده است و در همه آن‌ها اصلی‌ترین مشکل تشکیل لایه زیستی است. امروزه شبکه‌های نظارتی محیط‌های دریایی بسیاری در سراسر جهان کار گذاشته شده‌اند. با توجّه به گسترش روزافزون فناوری در سامانه‌های نظارتی، مشکل گرفتگی زیستی برای چنین سامانه‌هایی به یک مشکل فنی تبدیل شده که نیاز به حل دارد. چنین سامانه‌هایی، بدون محافظت مؤثر از گرفتگی زیستی کارآمد نخواهند بود. حفاظت از گرفتگی زیستی توسط سامانه‌های کلرزنی الکتریکی موضعی، راه حلی امیدوارانه و پیشرفته برای حسگرهای ساحلی است. چرا که نتیجه­ های موفّقیت آمیز زیادی با این روش به‌دست آمده است و تولیدکنندگان حسگرها با تغییر در سامانه‌هایشان می‌توانند یک سامانه‌ی قوی، ساده و کم انرژی ایجاد کنند. این حفاظت باید برای حسگرها و تجهیزهای ارتباطی زیر دریا و براساس فناوری‌های آکوستیک (صدایی) صورت گیرد. این مقاله ارایه کننده‌ی نتیجه­های به دست آمده در آزمایشگاه و دریا با ابزار گوناگونی است که به‌وسیله‌ی سامانه‌ی کلرزنی موضعی محافظت شده‌اند. Dumée L.F., He L., King P.C., Moing M.L., Güller I., Duke M., Hodgson P.D., Gray S., Poole A.J., Kong L., Towards Integrated Anti-Microbial Capabilities: Novel Biofouling Resistant Membranes by High Velocity Embedment of Silver Particles, J. Membr. Sci., 47(5): 552-561 (2015). Al-Juboori R.A., Yusaf T., Biofouling in RO System: Mechanisms, Monitoring and Controlling, Desalination, 30(2): 1-23 (2012). Verran J., Whitehead K., Factors Affecting Microbial Adhesion to Stainless Steel and other Materials Used in Medical Devices, Int. J. Art Organs, 28 (11): 1138-1145 (2005). Khani M., Bahrami A., Ghafari M.D., Optimization of Operating Parameters for Anti-Corrosive Biopolymer Production by Chryseobacterium Indologenes MUT. 2 Using Central Composite Design Methodology, Journal of the Taiwan Institute of Chemical Engineers, 30(5): 165-172 (2015). Creber S.A., Pintelon T.R.R., Graf Von Der Schulenburg D.A.W., Vrouwenvelder J.S., Van Loosdrecht M.C.M., Johns M.L., Magnetic Resonance Imaging and 3D Simulation Studies of Biofilm Accumulation and Cleaning on Reverse Osmosis Membranes, Food Bioprod. Process., 88: 401-408 (2010). Khani M., Bahrami A., Momeni V., Microbial Corrosion and Methods to Prevent and Control it Using Coatings and Biological Factors, Journal of Studies in Color World, 4(3): 3-20 (2015). Bahrami A., Momeni V., Khani M., The Effect of Surface Properties on Biofilm Formation and how to Prevent BioFouling, Journal of Studies in Color World, 4(3): 3-11 (2014). Donlan R., Costerton W., Biofilms: Survival Mechanisms of Clinically Relevant Microorganisms, Clin. Micro. Rev., 15: 167-193 (2002). Flemming H-C, Neu TR, Wozniak D, The EPS Matrix: the House of Biofilm Cells, J. Bacteriol., 189: 7945-7947 (2007). Hausner M, Wuertz S, High Rates of Conjugation in Bacterial Biofilms as Determined by Quantitative in-Situ Analysis, Appl. Environ. Microbiol., 65: 3710-3713 (1999). Körstgens V., Wingender J., Flemming H.C., Borchard W., Influence of Calcium ion Concentration on the Mechanical Properties of a Model Biofilm of Pseudomonas Aeruginosa, Water Sci. Technol., 43: 49-57 (2001). Lewis K., Riddle of Biofilm Resistance, Antimicrob Agents Chemother 45: 999-1007 (2001). Int. J. Biol. Macromol, 26: 3-16 (1999). Lehtola M.J., Miettinen I.T., Martikainen P.J., Biofilm Formation in Drinking Water Affected by Low Concentrations of Phosphorus, Can. J. Microbiol., 48: 494-499 (2002). Verran J., Jones M., In: Walker J., Surmann S., Jass J., Problems of Biofilms in the Food and Beverage Industry Industrial Biofouling Detection, Prevention and Control, Wiley Chichester, 32(6): pp. 145–173 (2000). Jafari Nasr, M., Balaei, A. Analysis of Fouling in HVAC Heat Exchangers by CFD, Iran. Chem. Chem. Eng. (IJCCE), 34(3): 51-60 (2015). Marvaldi J., Coail Y., Legrand J. ROSE, “CMM’06 Caractérisation du Milieu Marin”, 16-19 Seatech Week 2006 - Brest –Franc. (2006). Sarrazin J., Blandin J., Delauney L., TEMPO: “A New Ecological Module for Studying Deep-Sea Community Dynamics at Hydrothermal Vents”, IEEE catalogue no. 07 EX, Oceans 2007 IEEE Conference Proceedings, Aberdeen, Scotland, (2007). Delauney L., LeGuen Y., “Calibration Procedure for In-Situ Marine Fluorometer, In: International Metrology Conference 2003 Proceedings”, CD Publisher: Collège Français de métrologie. Toulon, France. (2003). Lehaitre M., Delauney L., Compère C., “Oceanographic Methodology series, Real Time Coastal Observing Systems for Marine Ecosystem Dynamics and Harmful Algal Blooms: Theory, Instrumentation and Modelling”, UNESCO Publishing, (2008). Delauney L., Cowie P., “Biofouling Resistant Infrastructure for Measuring, Observing and Monitoring”, Report Project no. BRIMOM EVR1-CT-2002-40023 (2002). Manov D.V., Chang G.C., Dickey T.D., Methods for Reducing Biofouling on Moored Optical Sensors, J. Atmos. Ocean. Technol., 21 (6): 958-968 (2004). Delauney L., Compère C., “Biofouling Protection for Marine Environmental Optical Sensors, International Conference on Recent Advances in Marine Antifouling Technology (RAMAT), Chennai (Madras), India. Proceedings of the International Conference on Recent Advances in Marine Antifouling Technology”, Allied Publishers Pvt. Ltd. (2006). Satpathy K.K., “Biofouling and Its Control in Power Plants Cooling Water System. International Conference on Recent Advances in Marine Antifouling Technology (RAMAT)”, Chennai (Madras), India. Proceedings of the International Conference on Recent Advances in Marine Antifouling Technology, Allied Publishers Pvt. Ltd. (2006). Delauney L., Lepage V., Festy D., “Biofouling Resistant Infrastructure for Measuring, Observing and Monitoring” Report Project no. BRIMOM EVR1-CT-2002-400 23 (2002). Aminot A., Kerouel R., “Hydrologie Des écosystèmes Marins, Paramètres et Analyses, Mesure de la Concentration en Oxygène Dissous”, INRA Edition. F-78026 Versailles France. Chap. VII. 32(6): 92-118 (2004). Fofonoff N.P., Millard R.C., “Algorithms for Computation of Fundamental Properties of Seawater”, UNESCO Technical Papers in Marine Science, 44, UNESCO Division of Marine Science, Paris, France, 53 :45-58 (1983). Blain S., Guillou J., Tréguer P., Woerther P., Delauney L., High Frequency monitoring of the Coastal Marine Environment Using the MAREL Buoy, J. Environ Monit, 6: 569-575 (2004).